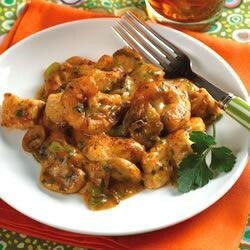 "I entered this recipe in a large neighborhood Cajun party contest, and won first prize. It is an unusual, but delicious way of preparing catfish." Sprinkle catfish strips with blackened fish seasoning. Spread catfish with mayonnaise. Place in a shallow dish, cover, and refrigerate for 1 hour. In a large skillet, heat 4 tablespoons butter until it begins to sizzle. Sear the fish strips until golden, turning once. Transfer to a 9x13 inch baking dish, and arrange fish in a single layer. In the same skillet, heat remaining 4 tablespoons butter over medium heat. Cook and stir mushrooms in butter until golden. Stir in parsley, green onions, and shrimp. Reduce heat to low, and cook until shrimp are pink and tender. Stir in cream of shrimp soup, and blend well. Ladle soup mixture over fish in baking dish. Bake at 375 degrees F (190 degrees C) for 30 minutes. This was a good recipe--nice change of pace with catfish. I will make this again, though, I thought that it had too much butter involved--I'll try 1/4 cup next time. Awesome dish! Cooked this for our super bowl party last night and it was gone in an instant. I used catfish nuggets for an easy appetizer-like dish. This will be a regular in our house. I have made this recipe twice now and my friends and wife swear I need to start a restaurant of my own.Thanks to the original poster!